Jeff Nichols’ masterful Midnight Run achieves a perfect equilibrium of head and heart by combining uncommonly confident and intelligent storytelling with emotionally transcendent performances that linger long after the film is over. It’s a classic science-fiction parable that effortlessly incorporates universal themes of parental comittment and our endless curiosity towards the spectacular in a way that feels both wholly original and spiritually satisfying. Similar to the brilliant beams of light that spontaneously shoot out from the eyes of one of the main characters, this movie locked my gaze from its transfixing opening scene and held it there unwavering throughout its run time. 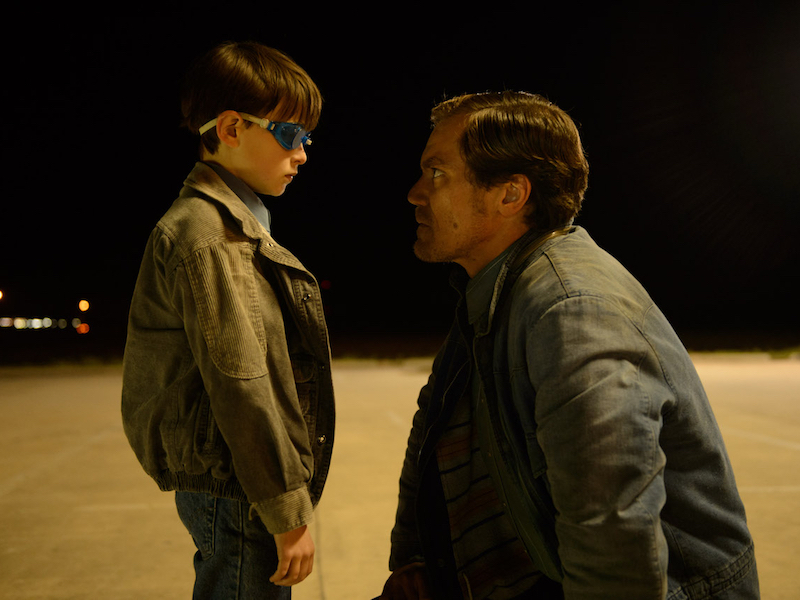 Nichols favorite Michael Shannon stars as Roy Tomlin, whose 8-year old son Alton (Jaeden Lieberher) exhibits supernatural abilities that inspire a religious cult dedicated to understanding the source and limits of his power. In doing so, they also draw the acute interest of the FBI and NSA, as the Alton-inspired “sermons” spoken by their leader Calvin Meyer (Sam Shepard) contain high-level government classified information. After recovering Alton from the cult’s compound with the help of his loyal friend Lucas (Joel Edgerton), Roy reunites with his estranged ex-wife Sarah (Kirsten Dunst) as the four plot to stay one step ahead of the authorities and discover Alton’s true calling. These events often play out with a level of ambiguity and narrative restraint that may frustrate those expecting a more streamlined and commercial movie that falls more in line with the traditional Hollywood mold. Nichols could have easily included loads of expository dialogue or even intrusive voiceover narration for the sake of clarity but I have such respect for the understated approach that he takes instead. He’s so careful in what he chooses for his characters to reveal –and more importantly, not reveal– in their dialogue to provide enough substance to move the story forward but also enough subtext to allow for deeper inference. It’s a brilliant script, full of poignant character moments and thrilling sequences of spectacle and grandeur, but it doesn’t work without the conviction of this all-star lineup of a cast. Shannon has proven himself as a fine actor in role after role (he’s starred in all four of Jeff Nichols’ features so far) but his work here as a father struggling to come to terms with his son’s miraculous condition may just be his best yet. Edgerton and Dunst are also excellent at feeding off the hopes and the anxieties of Shannon’s character, adding their own notes of emotional complexity to underscore their motivations. Collaborating again with cinematographer Adam Stone, Nichols again demonstrates his gift for the kind of brilliant visual storytelling that draws apt comparisons to masters like Cameron and Spielberg. His use of shadow and light is not only remarkable in terms of its composition but he also uses the two to serve as a visual motif for a world engulfed in darkness that slowly gives way to more luminosity as the narrative moves forward. He’s a rare talent in an industry that’s desperate for one now more than ever and there’s no doubt that he’s created something truly special this time around.